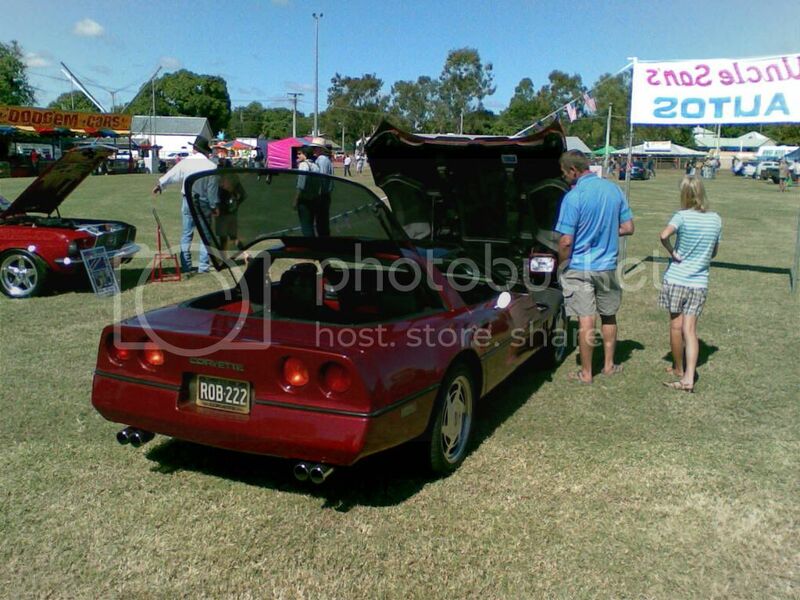 This is the third year I’ve driven my Corvette down to the long weekend Car show at Charters Towers. It’s a 6 ½ hour drive there and we always book into the same rooms at the Cattlemans Rest Motel. Our group this year was Bob in his 1976 Stingray. Ross driving Bob’s work Falcon with some Stingray support gear like the bag full of cleaning stuff, the big sign that clips under the hood and the poles for the flag. Bruce drove his Falcon Ute with some of my stuff and with him was another friend also called Bob (Bob #2) who was coming down to share our weekend. They eventually left about 7.15am Friday morning for the 6-7 hour drive from Cairns to Charters Towers. For the last week my back was playing up badly. There were moments when I could hardly walk and straightening up from bending could take 2 minutes. I was taking painkillers and anti-inflammatory tablets, seeing signs of improvement, then something would happen and it would get worse again. Bob arranged with everyone to leave at 7am Friday morning, this was a bit earlier than the previous 2 years and I decided to go later because of my back. I had a bad back spasm at 6pm the night before which made it hard to stand; it felt like my back was broken!! I’d been recovering, but packing everything into the vette pushed it over the edge yet again. When I woke up on Friday morning, there were signs that I was slowly recovering once more, thanks to the bulk painkillers and anti inflammatories. I was taking it very easy because another spasm would see me stay at home and miss the weekend. I dressed slowly, had breakfast and a shower then strapped my back support on tight. The car was already packed but there were a few last minute things and by the time I headed up the drive it was exactly 8.30am. Mo gave me a small bean bag cushion to put behind my back and that was a big help. Within an hour I had found a comfortable reclining position and the pain had eased a lot. My plan being that if the pain had got worse in the first 2-3 hours I would turn around and come home. 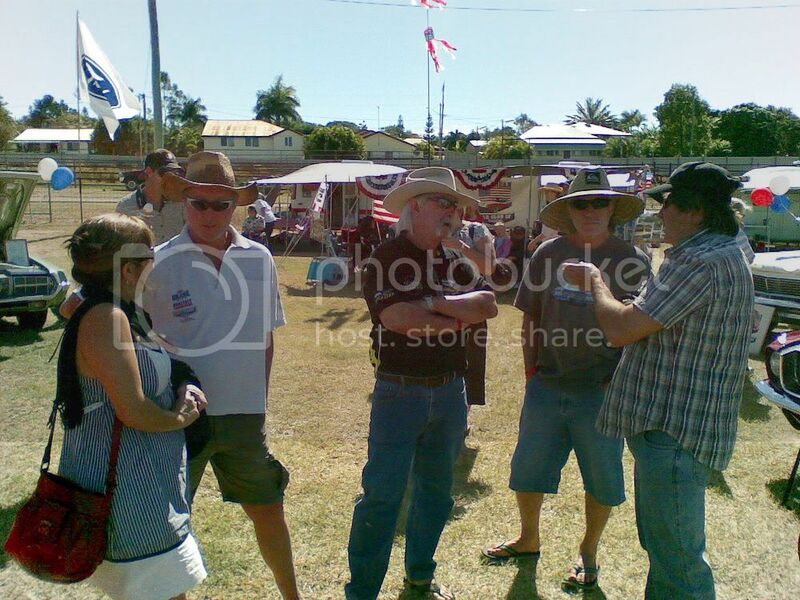 Just before 10am Bruce rang me, they had reached Cardwell. Driving in company with other cars is usually a little slower than driving alone and it seemed I might have already caught up about 15 minutes of the 75 minute time difference. Bruce told me they had to drive into Townsville to drop off some stuff at Bob’s workplace there, which would delay them and so we might meet up at Townsville. The weather was overcast and cool. Once or twice a few drops of light rain fell on the windscreen but otherwise it stayed dry. I was enjoying driving my Corvette and passing slower traffic without being held up too much until the roadworks outside Tully. There we had to follow a slow roller at walking pace for 3 kms. After Tully the road gets straighter and also smoother and the Corvette ran quietly in overdrive at 100kph doing around 1900rpm. After 2 hours driving I reached Cardwell and stopped for a pee. When I climbed back in the Corvette I couldn’t find a pain free position, which was a backward step. I was listening to an audio book on my Mp3 player plugged into the sound system – ‘Biggles Flying Detective’ which helped pass the time. The roadworks on the Cardwell range gave the clean vette a dose of mud and I wasn’t looking forward to cleaning it later that afternoon because of all the bending. Stuffed full of painkillers etc I had that usual zonked out feeling and I was driving very carefully, fully aware my reactions might not be as quick as usual. It made me feel like the guy in the Movie ‘Vanishing Point’ although he was high on speed and I was zonked on slow!! I was waiting for a chance to overtake a long line of cars and trucks doing 90kph when a small orange car zipped past and joined the queue in front of me. I always leave a gap so that I can start accelerating and build up speed when there’s an opportunity to overtake. The orange car looked like a Reliant Scimitar but turned out to be a Lotus Elite. After he had missed the next 3 overtaking opportunities on the long straight sections of the road 30 mins north of Townsville, I realized he had no plan, so at the next chance I passed him and the trucks and the caravan that was holding us all up. As the Townsville BP roadhouse came into sight, my phone rang and Bruce told me they had just arrived there. We met up and had some food. Bob & I had both topped up our tanks before leaving Cairns. My refuel at Townsville cost $37 for 98 octane and Bob’s $60 – another plus for fuel injection over carbys, but nothing beats that C3 Stingray shape!! We set off in convoy for the last 125kms inland to Charters Towers. Once in the 110kph zone we made good time on the open road. Bob had the Targa roof off his Stingray again this year and I had reminded him how cold he was after this stretch of road last year, so he had his coat on. Near the end of the journey we passed through three sets of road works, waiting just a few minutes at each one. We arrived at the Cattlemans Rest Motel and I discovered I’d forgotten my car shampoo and sponge. While Bob began his long cleaning and waxing routine, I borrowed his sponge and gave my vette a very rough wash, being very careful of my back, then dried it with a towel. I now think towels are the best way to dry a car. Even better than the microfibre cloth I usually use. It was already cold but as day turned to night, and Bob was still detailing his vette, the rain began. At first it was light mist, ‘Tasmanian Weather‘, declared my room mate Bob #2 who grew up in Tassie. A group of bikers arrived, some with 3 wheeled Harleys and all with impressive sounding exhausts. By the time Bob had finished the rain was coming down heavily. We put our cars to bed. It felt like about 9pm but was only 7.30pm. We moved into a warm motel room to watch the footy. After that there was more talk and then to sleep. Many of our car club were staying in Caravans at the showgrounds and they had a miserable night because of the rain and the cold. They reckoned it got down to 2C. One of the friends we meet at Charters Towers every year, Andre, runs a swap site and he had decided to camp there this year but the rain flooded the site and he spent an uncomfortable night sleeping in his car. We met up with him the next morning and he was pleading for us to get him a motel room!! On Saturday morning it was v cold. My room mate Bob #2 is used to getting up at 4am. His alarm rang at 3.30am and he struggled to stay in bed till about 6am which was late for him and bloody early for me!! I woke up and amazingly my back was cured!!! The drugs and a few beers having relaxed what must have been a very intense spasm. It was really incredible and I was very lucky. I knew I’d better continue to be careful, but it was a great relief. Bob’s vette took a while to start, due to the cold, then we drove from the motel to the showgrounds & met up with the rest of the car club. It was decided not to set up our club display until after the traditional procession around town, scheduled for 11am. It was bitterly cold, somewhere around 10C, the wind increasing the chill factor. I had every piece of clothing on but never got warm. Bob had paid admission fees for his Falcon as well as his vette, but Ross driving the Falcon, not knowing that, paid as well. I had been waved through without paying, so we worked out what had happened and I paid Bob. He wasn’t happy though, he felt he hadn’t paid enough and was going to go and pay some more cash. I suggested that as he had put so much work into preparing his vette, the money would be better used paying to enter the judging competition – something we usually don’t bother to do, being happy just to be in the club display and enjoy the weekend. Bob went off to enter the judging comp and Bob #2, Bruce and I went over to the pavilion for breakfast. We had a full breakfast of 2 eggs, 2 sausages, 2 slices of bread, several pieces of bacon, then wandered around the swap meet. 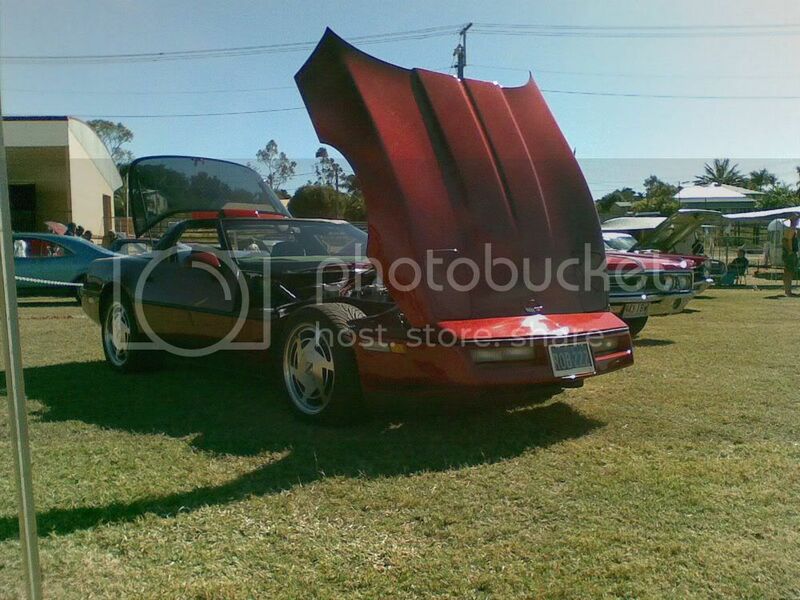 Next to Andre’s site was the Lotus Elite that had passed me on the road to Townsville. I spoke to the owner, Brian, who’s accent suggested a Northern Ireland heritage. He had the car for sale and I guess he thought showing it at the swap site was a better way of selling it. He said the engine had been reconditioned. Being used to Corvette’s I thought the Lotus Elite was a bit weird, being so low and with 4 seats. After that we wandered around looking at all the cars on display. It was a grey overcast day with rain threatening, or would it be sleet?? Haha not in North Queensland!! Luckily neither arrived. We drove around Town in the procession of about 60 vehicles, Performance, Historic, Classic, Hot Rods etc, led by a police car and with cops at the main intersections holding back the traffic for us. One kid saw my vette and we heard him shout excitedly, ‘wow look at that! !’ Usually everyone is ignoring mine and staring at Bob’s gleaming red Stingray. The kids that like the C4 Corvette shape often recognize it from video games. 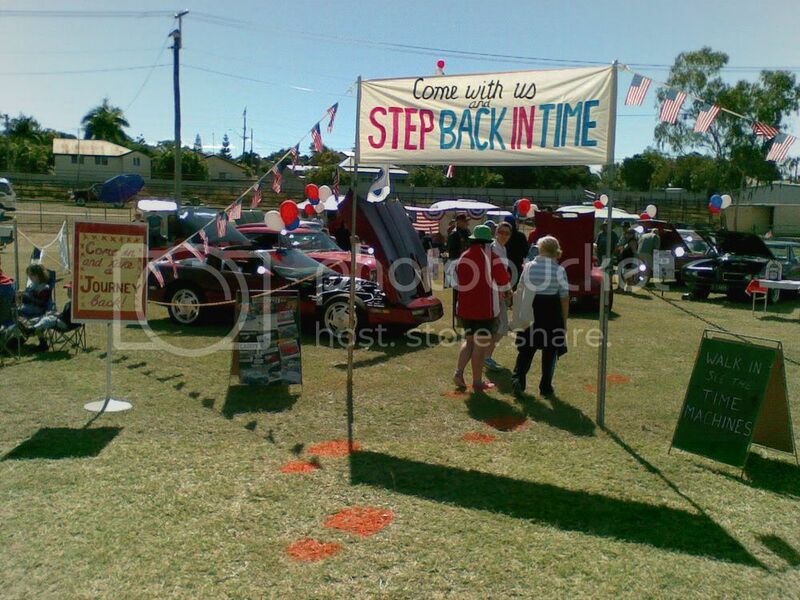 Back at the showgrounds we parked Bob’s vette on the chequerboard display vinyl and set up our cars to form a club display. The actual judging wasn’t until Sunday so this was a trial run. On Sunday we had more flags etc and a good display which won the trophy. By lunchtime I was hungry again and had curry & rice which was ‘Clive of India’ mince with peas and corn, not up to my Curry Nirvana standard but still tasty. The anti inflammatory tablets I’d been taking all week finally had their usual effect on my stomach (no it wasn’t the curry!!) and I had several attacks of Diarrhea, made more difficult by having to remove the back brace and all the clothing I was wearing. I don’t think anyone noticed my urgent, bum clenched, Charlie Chaplin walks to the toilets!! Luckily in the rush to get to the showgrounds I had forgotten to take another anti inflammatory tablet that morning and I knew that I mustn’t take any more. On Saturday afternoon there was a Go to Whoa competition. The bitumen where it’s held is getting very cut up, especially at the start, and there is loose gravel making it tricky to get a good grip to accelerate and also to brake. Competitors are given a flag start and have to accelerate 50 meters and then stop with their front wheels on a white line. It’s not as easy as it looks and many people miss the line, generally sliding past it with all 4 wheels locked, which we know is not the best way to stop a car!! Even an old steam powered vehicle from the early days of automobiles competed, and did OK. Of course his wheels were the size of stagecoach wheels and he had a good view of them. I think he got into 2nd gear on his last attempt- it’s hard to know what is happening as he pulls different levers and there is a hissing and chugging. We walked around looking at more cars that had arrived. By 3pm I was chilled to the bone. I’d had enough of the miserable weather so I drove back to the Motel to warm up. The two Bob’s, Ross and Bruce arriving soon after. We had a few beers, caught up with the Ingham guys, Ross, Theresa and Neale that we meet there each year and at 6.30pm we walked down to the Waverley pub for a feed. The club members camping at the showground were there too and we had all the tables pulled together in the covered outside area, with about 20 of us around them. We had some good food but it was cold so we headed into the pokies room to get warm. I watched Bob work the pokies. The last time I played poker machines they had a handle on the side and weren’t connected to a computer in Brisbane, and Bob explained how the system works these days. The computer does all the work and it’s a bit scary to think it’s all pre ordered to make a set profit. With great cunning Bob beat the system. After that we walked the short distance back to the motel room to watch more footy. We were all up early Sunday morning and drove over to the show to set up. Two of these cars won prizes- the other one is mine!! When everything was in place we headed off for another full breakfast. I normally don’t eat much breakfast but the cold weather made me really hungry. I tied on the new windscreen banner which includes John Bondok’s phrase ‘The Best Value Sportscar in the World’. The weather was so miserable I saved my back and left the Targa top on. I stuck a couple of Info sheets on the dash which could be seen through the windscreen and put a FOR SALE sign under the wipers. It didn’t feel like car selling weather !! I didn’t get any enquiries but it was a good start to the campaign. Several more vehicles turned up and I voted my personal award, ‘Best Smell’ to a 39 Ford army car. The interior was original, the leather was very cracked and it had a great old car smell. My ‘best Smell’ award started 3 years ago when I noticed the smell from a TR6 which reminded me exactly of my old TR3A. Is there a ‘Triumph’ smell? It seemed there was that day, the next day the smell had gone, perhaps because the TR6 had its roof down for two days in the sun and wind. I had a long talk to Rob Casper who has an immaculate 1987 Corvette for sale, his partner is a car detailer and it shows, the black is BLACK, the Red is RED!! He’d only driven it once since we met last year which seems a shame – cars are for driving!!! 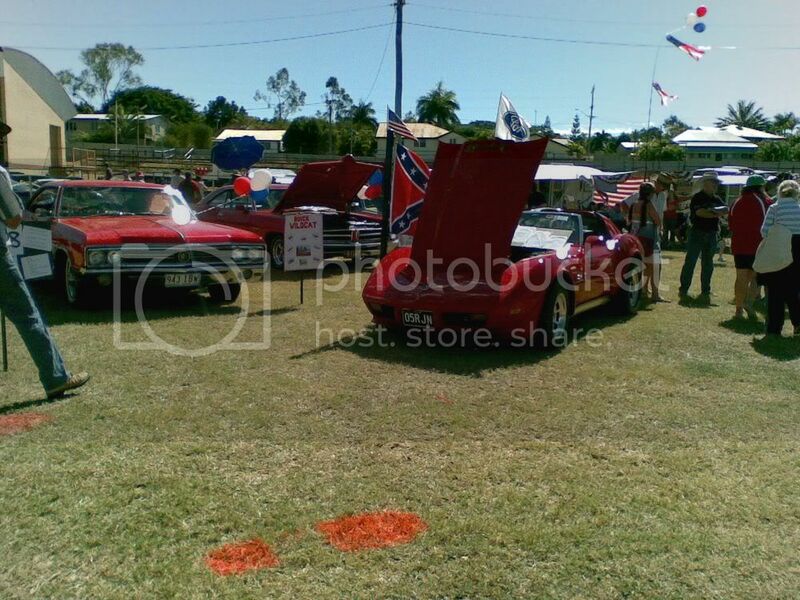 I also spoke to Australian Corvettes Association member Troppo Vette who had driven over from Townsville to say hello. This year he left his white C4 outside the gates, which was a pity, I’d have liked to see what he’d done to it since last year. Curry & Rice again for lunch, just because it was hot and easy to eat standing up, then another walk around the swap sites. Some of the stalls had packed up and left. The judging was taking a long time, I sat and watched a DVD on a TV outside our club awning. The DVD was US. Muscle V8 Collection, a 3 disc set and detailed the stories of the major US Muscle cars from conception onwards. I’m getting a copy as it was the best one I’ve seen. At 3pm we went for another procession drive around town, then assembled for a long awards ceremony. The sound system was loud but the nearest speakers were too far away and the sound was very confused, it was almost impossible to hear what the MC was saying. Bob won ‘Best American’, WOW brilliant. Our President Robert Hall’s Trans Am won 2nd prize in the same category, WOW!. The club won best display WOW!! we were scooping the pool!!!! Congratulations to Helen and Paula and team who plan and organise our display each year, somehow they had hit the right, prize winning display. Aaron and Robert Hall our president came second in the observation rally, something I’ve never entered but plan to next year. What a great club result. Back to the Motel and a beer. We watched amazed as the grey sky cleared just before dusk and revealed a clean blue sky. We had heard of a good pub in town that was warm and had music, so around 6.30pm we ordered a 12 seat Taxi and we & our Ingham mates piled in. When we arrived at the pub there was some problem, I think they wouldn’t let kids in and Neal from Ingham had his young son with him. We walked to the next pub down the road. We’d been cold for two days so when we walked in it felt like an oven, although the bar staff were wearing coats. Bob played the pokies and won again, we had a good meal but my rare steak was blue which is too rare. It’s always hard to know how the chef interprets ‘rare’- anyway it tasted fine. When we left the two women bar staff called a taxi for us but it never arrived. It wasn’t that late but it was very quiet on the street, I got the feeling that ‘Charters Towers is now CLOSED’. Luckily Theresa sat inside the pub door to keep warm and so they couldn’t lock up until our taxi arrived. Eventually, because the two women wanted to go home, they offered to give us a lift home in their cars, which we were grateful for. It would have been a long and COLD walk back to the motel. We stood outside our motel rooms having a beer and chatting under the stars until about midnight. My room mate, Bob #2, woke up very early, before 6am I think. He went outside for a smoke and left the door wide open. The motel rooms had no heating but were warm enough, with the door closed. I got up eventually, we paid the bill for our room and thanks to Bob #2’s early rising, I was loaded up and ready to go before Bob, Ross and Bruce showed their faces. As Bob was staying in Townsville for work, Ross was going to drop the Falcon there and drive Bob’s Vette back to Cairns. There was no point in me following that procession, so as I was ready to go I said goodbye and headed out of Charters Towers for the long drive back to Cairns. The weather stayed good. It was a typical blue sky day. I reached the 3 sets of roadworks and the ground had just been watered, so I knew that was the end of having a clean vette. I continued listening to the Biggles Audio book, enjoying the warmth of the sun with closed windows. I worked my way past the occasional traffic and long road trains and then had a clear road for half an hour. It was a beautiful day. I refuelled at Townsville and made my way North with the ever increasing heat of the morning sun shining in the windscreen and through the glass roof. I reached Cardwell at noon and stopped for a sausage roll, it was big but not that tasty, however, as I sat reclined in the vette, with the big V8 burbling along at 100kph, on a blue sky day, with music playing on the stereo, sausage roll in hand, it felt like one of those fantastic moments that we remember forever. I was really enjoying the drive. I arrived home at 2:20pm, a tad under a 6 hour drive. Long enough to feel I’d had a good drive but not so long as to be tiring. I knew the vette was dirty so I gave it a wash straight away. It was the dirtiest I’ve ever seen it, WTF were they using on the roadworks? It was like cement dust. These photo’s don’t show how bad it was. There was no shine in real life, covered with clay or cement dust! So ends another Charters Towers weekend. It’s hard to capture on paper the camaraderie, the laughs and why I am desperate to go each year. Since I stopped sailing, it’s the closest thing I do now to an adventure. Both Bob & I agreed that driving our Corvettes long distance is very different from doing the same journey in a normal car, it makes us feel extra alive. I really enjoy driving my C4 on long trips. I enjoy the technology both under the hood and in the cockpit where everything is to hand and the seats fit my body. Overtaking with 5.7 litres of fuel injected grunt is easy, except that there are many people driving along at around 93kph and as usual they speed up to over 100kph when there is an overtaking lane, making it impossible to pass without going over the speed limit. When the overtaking lane ends they all slow back to 93kph!!! If I am still at the rear I wait for the brake lights to come on as everyone slows back to 93kph, and they always do! I use the cruise control all the time. If I catch up to another car, then my rule is to overtake it, even if it seems at the time to be going close to the speed limit, because they will always slow down if the road gets dark with overhanging trees, goes uphill or goes round a long corner. Plus when they catch a slower vehicle they will then take ages to pass it, if at all. On a short trip of 30 mins, overtaking is not so important because there’s not much difference in the time the journey takes, but in a 6 hour trip, the difference between 100kph & 93kph can mean an extra hours driving. I’m currently considering selling my Corvette. It’s kinda crazy after all the money and work I’ve spent getting it into good condition, but there are other cars I’d like to have and as I grow older I see that there are only so many years left for me to do that. My next car might be either a late model C5, a Stingray, perhaps 1982 or a Trans Am/Camaro. If I do sell the vette and get an older stingray, I wonder if I will enjoy the long drives as much ?